The poetry of mountain biking, part 2. Over the past 12 months, I’ve logged a few hours doing trail improvements in Pemberton. Well, mostly I battle mosquitoes. And fill buckets with mineral earth to shuttle back and forth, while the people with real skills build bridges and berms and analyze lines and tell me where to go next. But the tally of hours has given me a greater appreciation for the unseen hands that built and maintain the trail network I happily play on. 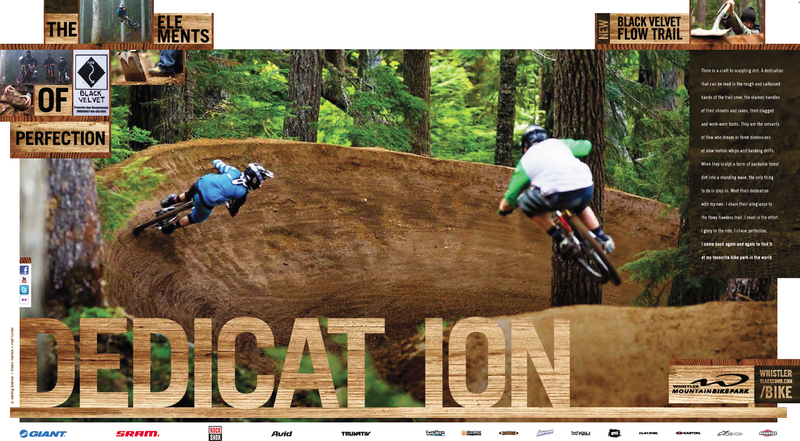 In the third installment of the Elements of Perfection campaign, which appears now in Decline magazine, the Whistler Mountain Bike Park wanted to acknowledge the hard work of their trail crew, as well as the devotion of loyal riders who keep coming back to ride there. The element: Dedication. Dedication. There is a craft to sculpting dirt. A dedication that can be read in the rough and calloused hands of the trail crew, the stained handles of their shovels and rakes, their clagged and work-worn boots. They are the servants of flow who dream in three dimensions of slow motion whips and banking drifts. When they sculpt a berm of packable forest dirt into a standing wave, the only thing to do is drop in. Meet their dedication with my own. I share their allegiance to the flowy flawless trail. I revel in the effort. I glory in the ride. I chase perfection. I come back again and again to find it at my favourite bike park in the world. Previous Post Proof that mountain bikers can appreciate poetry.